Five weeks into his new job as a corrections officer at a state prison, Robert McGaffigan received a horrific lesson on the dangers of the work. Tammy Sperle was a civilian worker who operated the prison store at what was then the Huron Valley Men’s Facility when an inmate angry about losing his job there strangled her. McGaffigan, known as a “red tag” at the time because he was fresh out of the academy and in training, recalled the Mobilization Center going off and the prison sending all workers home. He heard about what had happened on the news that night. Quitting never entered his mind, McGaffigan said, but the incident revealed what can happen in a prison. McGaffigan, now 51, was the owner of a cabinet company in Swartz Creek in the early 1990s. He was concerned about his lack of health insurance, especially since he had children. He also realized he needed a job that could help fund retirement. One day, he went to a cabinet customer’s house near Lapeer, where two Department of Corrections employees lived. The subjects of money and insurance came up and the two corrections workers suggested to McGaffigan that he consider working for the department. McGaffigan went about getting the corrections classes he needed from Mott Community College; took the state civil service exam; submitted to an interview; and was hired as a corrections officer in 1995. He worked at Huron Valley until 2004 and recalled it as a dangerous place. He said there were many “criticals” – incidents like fights and stabbings or prisoners who would mutilate themselves. When officials decided to convert Huron Valley to a women’s prison, McGaffigan transferred to the Earnest C. Brooks Correctional Facility in Muskegon Heights. McGaffigan started out in the Level II unit of the facility before moving to Level IV, the highest security level. Now he works in the segregation unit, which McGaffigan calls “seg” and is commonly known as “the hole.” There are 22 cells, and they are almost always full. Anything can happen, he said. Inmates in segregation are there for getting in fights, assaulting other inmates or because they are on suicide watch. The day McGaffigan was interviewed, an inmate had slit his wrist in the shower. In another recent incident, three or four inmates simultaneously attempted to hang themselves with sheets or blankets. A prisoner goes on “stool watch” when he’s suspected of smuggling in drugs by swallowing a balloon containing a controlled substance. The inmate is forced to sit on a special stool that has a bag below it to catch the inmate’s feces so it can be checked for the drugs. McGaffigan says that is a tough, but important task. 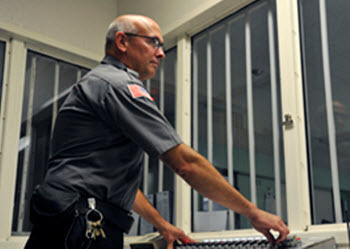 He was named one of two corrections officers of the year in 2012 by the department for helping to write policies and procedures for stool and suicide watch, which included a requirement for officers to sign a statement that they understand all the procedures every time they go on watch, such as always keeping their eyes on the inmate. Despite the inherent danger and unpleasant tasks, McGaffigan said he loves his job. McGaffigan credits his enjoyment of the work to having a good partner, Jason Beetz. They always know what the other is thinking, he said. And that is what McGaffigan said is the best part of the job – working with good people. “I have a lot of very good staff that I work with. It helps with everybody’s positive attitude,” he said. “We can still do our job in a professional way, but we can still joke around and be serious about our job. McGaffigan said he has not been involved in an incident where he felt his own life was in danger. He has felt adrenaline, but not fear, he said. But he’s always conscious of the threat. “Everybody’s fortunate to go home every day,” he said. Editor's note: This story was produced in a collaboration between Bridge Magazine and the Gongwer News Service. Zachary Gorchow is editor of the Gongwer News Service in Lansing. Gorchow previously worked as a reporter for Gongwer and at the Detroit Free Press before becoming the news service's editor. He is a graduate of Michigan State University. Thank you for your service Mr. McGaffigan. My question to you is after 20 years of "serving" with many inmates convicted of a wide variety of crimes, how many are there longer than they should be due to the nature of their crime and their danger to society? Since most people are incarcerated for nonviolent drug offenses, I'm curious, in your opinion, if taxpayers are spending their money wisely?